The Clymb Review: Is the Clymb Legitimate? When I found out about TheClymb.com, the first thing I thought was ‘this is really weird’. I couldn’t go onto the site without creating an account. After I created my account, I understood why. Every day, there’s a new gear deal, where name brand gear is sold at massive discounts. The gear is usually from past seasons, which is why it’s discounted. In a nutshell, The Clymb is an online outlet store which mainly sells outdoor gear. It’s a bit fun to find the best deals and to rush and get them before they sell out. There are deals for products ranging from protein bars to adventure travel tours in the Himalayas. Yes. I’ve purchased around $300 worth of gear from The Clymb, so I can confirm that the site is 100% genuine and the gear is also 100% genuine. Buying Tip: If you want to find a deal on something that you need without wasting your time checking the site everyday, just look out for their emails. When creating an account on TheClymb.com, you are automatically included into their email list. I’ve noticed that products on sale tend to sell out really fast, so it’s always important to be on top of your game. When you browse for gear, make sure you know what you need because chances are you will find something really cheap then convince yourself you need it when you really don’t. 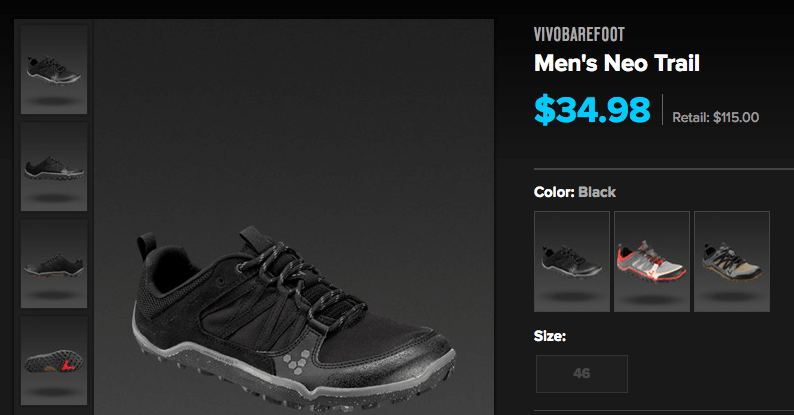 Recently, I placed an order for a pair of minimalist Vivobarefoot shoes and a Salomon softshell jacket. 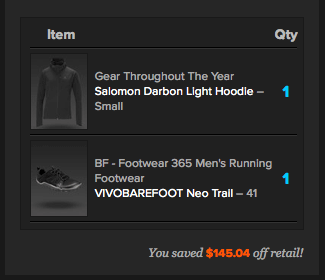 I saved $145 off retail! The shoes cost retail $115, but I got them for $35 during a special 3 day sale. Shipping is usually around $8 dollars, but I got it for free because of a special promotion. My total came to around $90. You could potentially refer all of your friends and get free gear. In terms of shipping and returns, The Clymb falls short. Shipping is almost never free, unless you buy one of their ‘The Clymb’ branded tees or socks. Once, I was about to order a button down shirt on The Clymb only to find that shipping would take a month. I would have been out of the country by then, so I couldn’t order it. Usually shipping takes a week or two. Make sure you know your sizing before buying things on The Clymb because they have a complicated return policy. Usually you’ll get store credit and not money back when returning. Read more about their return policy here. Some products are not eligible for returns. I guess The Clymb is trying to get rid of their inventory, which is why they make it difficult to return things. An issue I have with TheClymb.com is their limited selection of gear. Since deals come and go, they don’t always have the items that you like. It can also be hard to get clothes in your size. Most of the clothes that are sold on The Clymb are overstocked and like what you would find in a factory outlet store, so some clothes only come in sizes like XL or XS. There are always new deals coming up, so it’s not possible to get the best deal ever. For example, about an hour after I put my order in, I just found out that there was a new coupon code for 20%. I guess you win some and lose some. Also, not much information is provided for the products that are sold on The Clymb. That can be annoying, but I usually check the product on other websites, like amazon.com to find more information and for a price comparison. When purchasing my Craghoppers convertible travel pants on TheClymb.com, I noticed that the product description stated that the pants were convertible, but product image did not have a convertible zipper. I took a risk and bought the pants and they were convertible, as the description stated, but unlike the photo. Another time, I purchased a pair of Columbia socks, which had a vague product description. I assumed they were made of merino wool, but they ended up being polyester, which was kind of disappointing. With that said, just be careful and do your research when buying from The Clymb. Unlike sites like REI.com and eBags.com you won’t find a specific ‘travel gear’ category or luggage in general. However, most of the gear sold on The Clymb can be used for traveling, such as the shoes that I got. Overall, TheClymb.com is an awesome gear site where you can find some amazing deals. I’m a big fan of the site and have already purchased hundreds of dollars worth of gear from them. The deals are better than what you can find on REI Outlet or in most physical stores. You can sign up for a TheClymb.com membership here, and you and I will both get $10 worth of credits. Where do you get your gear? Leave your comment below. Thanks for commenting, Ej! Interesting how you mention that. Yes, I have noticed at times that their “retail prices” are higher than the normal ones. I’d recommend always checking around if you truly want the best deal. I will have to say, though, that sometimes I do find the best prices at The Clymb, but not always.